Best remembered as Norma Desmond, the deranged former silent star of 1950’s Sunset Boulevard, Gloria Swanson was, indeed, one of "the greatest stars of them all" back in the days before the cinema had sound. These ten remarkable films showcase Gloria Swanson’s beauty and versatility decades before she was "ready for her closeup." From her early days in funny but flimsy Mack Sennett two-reelers through her more substantial roles under the tutelage of Cecil B. DeMille and on into the sound era of romantic comedies, here is Gloria Swanson at the height of her powers and popularity, alongside such fellow legends as Wallace Beery, Lionel Barrymore, and even Charlie Chaplin. No fan of classic cinema should miss out! His New Job (1915) – This is actually a Charlie Chaplin short about life on a movie set, co-written by gossip queen Louella Parsons (! ), costarring Chaplin’s rival Ben Turpin, and – as a stenographer – 18-year-old Gloria Swanson! A fascinating vintage curiosity. 32 mins. The Danger Girl (1916) – Cross-dressing in 1916? You bet. Gloria stars as a lovesick girl who dresses up as a man in order to seduce a rival femme away from her beau (Bobby Vernon, her Mack Sennett costar). 20 mins. Teddy at the Throttle (1917) – Classic comedy with Gloria as a naïve girl who winds up tied to the railroad tracks by the villainous Wallace Beery –her real-life husband at the time (and nearly as villainous). "Teddy" is Keystone Teddy, the Wonder Dog. 25 mins. The Sultan’s Wife (1917) – Gloria and her boyfriend sail to India where an evil Rajah wants to make her part of his harem. Once again, Teddy the Wonder Dog saves the day! 20 mins. Male and Female (1919) – Turning from comedy to a Cecil B. DeMille drama, Gloria is a spoiled rich girl who learns about the qualities that really matter when she’s shipwrecked with her resourceful butler (Thomas Meighan of The Miracle Man). 115 mins. 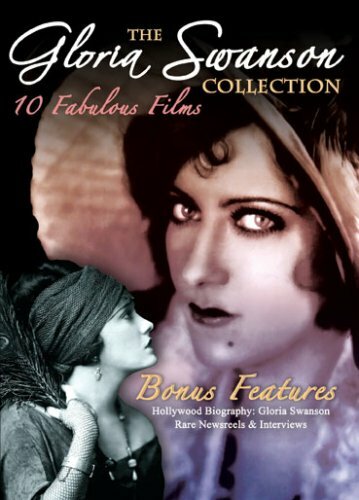 Hollywood Remembers Gloria Swanson – A fascinating look at the life and career of Gloria Swanson, from her early Mack Sennett days through Sunset Boulevard and beyond, featuring classic clips. 25 mins. Don’t Change Your Husband (1919) – A DeMille comedy with Gloria as a frustrated housewife who divorces her slob of a husband (Elliott Dexter of Flaming Youth) and marries another (Lew Cody of Dishonored), only to find she’s gone from the frying pan into the fire. 60 mins. Why Change Your Wife? (1920) – Another comedy from Cecil B. DeMille in which Gloria – in a variation of the previous film – is the wife who is divorced by her frustrated husband (Meighan again) after he meets the lovely Bebe Daniels (42nd Street). 91 mins. The Affairs of Anatol (1921) – This time, both husband and wife are two-timing each other in this DeMille comedy that features the ill-fated Wallace Reid (who had little more than a year to live) and, once again, Bebe Daniels. 117 mins. Sadie Thompson (incomplete) (1928) – Arguably Gloria’s finest performance of the silent era; Somerset Maugham’s classic tale of a loose woman (Swanson) who sails to Pago Pago to start a new life, only to fall under the influence of an unforgiving and overzealous preacher (Lionel Barrymore of It’s a Wonderful Life). Sadly, the final reel is currently lost to the ages. 82 mins. Indiscreet (1931) – Leo McCarey (The Awful Truth, Going My Way) directed this witty romp, with Gloria as a young woman who is tempted to stray from the man she loves (Ben Lyon of Hell’s Angels)by an unsavory old flame. 81 mins. Newsreel & Interviews – A fascinating assortment of Swanson rarities, including vintage newsreels and interviews. 8 mins? Total: 675 mins. = 11-1/3 hrs.